Developer Tesla Audio Sciences believes that through the proper music and beats, your brainwaves can be changed to be more focused or relaxed. And that’s what the iPhone app developer attempts to do with AmbiScience Brain Power, a $2 ambient music and sound app aimed at helping you keep your focus. And in my testing, AmbiScience delivered in a big way. Train Your Brain: Use slider switches in AmbiScience to set the proper beat for focusing, meditating, relaxing, or sleeping. AmbiScience offers what Tesla Audio Sciences calls a BrainWave Entrainment feature. Basically, the idea is to get the frequency of your brainwaves to sync up with a periodic stimulus that best allows you to focus on the task at hand—whether it’s working, relaxing, meditating, or sleeping. In AmbiScience’s case, the stimulus takes the form of ambient music and sound effects. You start by choosing the sound from the 11 tracks listed in the app’s main menu, each one sporting evocative names like “Buddhist Rain” or “Angel Ascension.” The music is perfectly looped so that you can listen non-stop. 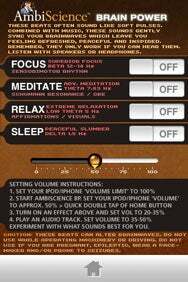 You can then add the brain power beat of your choice by setting whether you want to focus, meditate, relax, or sleep. I admit to being skeptical about the app’s claims heading into testing AmbiScience. And I can’t say whether or not my brainwaves were altered when listening to the background sounds. But I do know that I felt more focused while using the app at work for several days. I would work fairly diligently with the app running on my iPhone and my earbuds blocking out all external distractions. When interrupted by a co-worker, I would take my earbuds off and immediately feel like I had been yanked back into reality. If you have trouble relaxing or staying focused, you should definitely give AmbiScience a try. I plan on keeping the app as part of my work routine. AmbiScience Brain Power is compatible with any iPhone or iPod touch running the iPhone 2.2 software update.